Serving the rail and steamship yards in Grand Rapids and Detroit, Michigan; and Chicago, Illinois. Van’s Interstate Service, Inc. offers Intermodal drayage serving the rail and steamship yards in Grand Rapids, Michigan; Detroit, Michigan; and Chicago, Illinois. In order to utilize our service on your door routings please advise your freight forwarder or steamship line that Masselink/Van’s is your preferred carrier. In addition we offer LCL (less than container load) service to select points. Warehousing and distribution services are available through Van’s Logistics Service, LLC. Van’s Interstate specializes in full container Intermodal Drayage. Our service area includes Michigan’s lower peninsula as well as select points in Northern Indiana. Container Yard in Grand Rapids, MI – Customs Bonded Facility. Container neutral pool strategically located in West Michigan. Drop container service for loading and un-loading at no extra charge in many locations. Track and trace imports and continuously monitor all imports and exports to ensure on-time service. Confirm appointments and deliveries via phone / email or direct update to web portals. Street turns of empty equipment from imports for exports are a priority for us. Communication – we keep you informed at all times. We make it a priority to street turn every piece of equipment possible. Street turns eliminate empty miles – which reduces your costs and reduces truck traffic on the highway. When street turns occur, your rate will decrease and you will receive an email advising your new reduced rate. 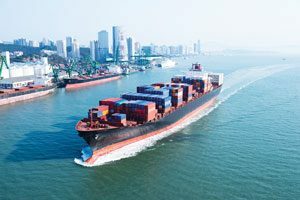 Offering Steamship Line origin and termination of empty ocean containers, and Grand Rapids, Michigan bill of ladings on Import and Export full container loads. The Container Depot and Yard is a Steamship Line controlled Neutral Pool Facility and all equipment availability questions and termination authorizations must be handled directly with the Steamship Lines. The amount of equipment on hand will vary by Steamship Line and seasonal demands. Your Steamship Line door packages are only as good as your Drayman. We work with the majority of the Steamship Lines on a door basis already. Please consider naming Van’s Interstate as your preferred Drayman. Compare your door rate to the combination of a ramp or CY rate and our drayage rate. There may be ramp or CY rates established for your commodity that you can take advantage of.